Please note that this camp is for JO Levels’ 5 through 10 and Xcel Levels’ Gold, Diamond, and Platinum. The dreaded beam! Like many gymnasts, beam was once my least favorite event. There came a time in my career when I knew that in order to take my gymnastics to the next level, I would have to conquer the beam. Only after I forced myself out of my comfort zone was I able to break through the barrier of fear that kept me from being great on beam. Once I finally figured it out, beam quickly became my favorite event and I went on to win two NCAA Championships titles on beam. Most importantly, the confidence I gained in myself after having conquered the beam, carried over to my other gymnastics events and into my life outside of the gym, as I felt empowered and ready to stand up to any challenge! I want to share the same strategies, techniques, and secrets that I discovered in my journey to success with other young gymnasts so they can love and embrace beam at an earlier age than I did. Nothing would bring me more joy than to see girls conquer their fears on this event, giving them more confidence in and out of the gym. They will leave learning the 3 rules of the Triple Threat, which is part of the beam curriculum I’ve created to help gymnasts understand how to stay on beam. Our goal is to create a collaborative, fun, and inspiring culture at the event, that instills a new positive perspective and approach to beam. This clinic focuses on developing new skills, cleaning up old skills, building positive mental cues, and dealing with pressure. Most importantly, this clinic focuses on confidence—the belief that these girls can do whatever they set their minds to. Through goal setting, visual learning, drills, games, mantras, dance, and skill work, this clinic dives into a 2-day (4 hours each day) Bootcamp to tackle the most difficult event in gymnastics while delivering the tools and resources needed for success. It’s $275 per gymnast and they will receive a complimentary Beam Queen Bootcamp journal at registration that they will be able to take to the rotations. The dates are November 10th & 11th, 2018. We have an extremely passionate and inspiring staff comprised of both athletes and coaches from the collegiate and elite level gymnastics, and we are committed to seeing improvement in these young gymnasts. We will destroy beam’s reputation as the “Make or Break” event, and most importantly, we will have FUN doing it! 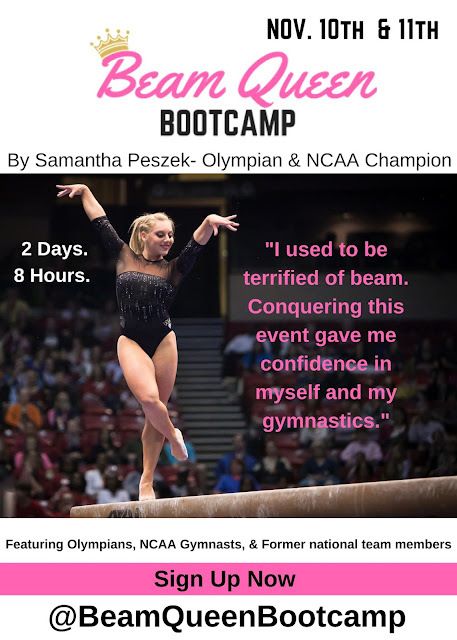 Let us help your gymnast become a beam queen!